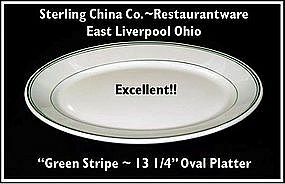 This 13 1/4" oval platter was made by The Sterling China Co. in the 1950's or so. It has very little, if any, use on it. It is very unusual to see platters in restaurant ware. These are very high quality and in nearly pristine condition! 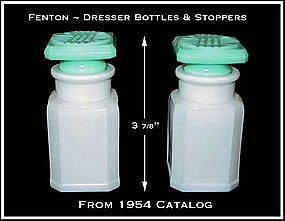 These dresser bottles were part of a 3 bottle ensemble that set on a small tray on a dresser. The bottles are white and have light blue tapered lids. One on the bottles has a line on it in the middle, but no big deal. 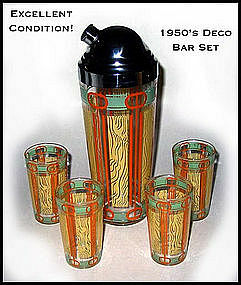 They are shown in a 1954 Fenton catalog. 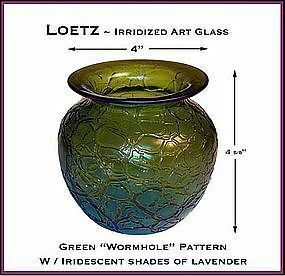 Loetz Iridescent Green Art Glass Vase ~ Superb! This Loetz iridescent green & purple art glass vase is in excellent condition. We have been told by a collector "in the know" that this pattern is called "Mimosa". It has a ground pontil and is not signed. Stunning! 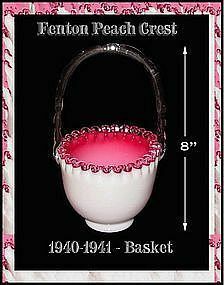 This Limited Edition Peach Crest 8” basket was made from 1940 - 1941 by The Fenton Art Glass Company. It is in excellent condition with no chips, no scratches, and no funny spots. It is not signed, but they didn’t sign things in the 40’s... they used a paper foil label. Very nice! 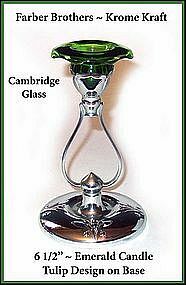 Unusual emerald green Farberwre tall candle with tulips on the base. The glass is Cambridge, and the bottom of the metal base is signed. The condition is excellent! This has not been cleaned or polished. 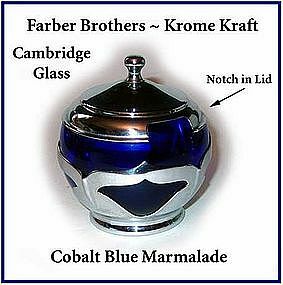 Cobalt Cambridge Glass Co insert in Farber Ware metal base and lid with slot for spoon. Signed on bottom. Metal is good and has not been polished. Estate fresh from here in NW Ohio. Deep cobalt blue, no damage. 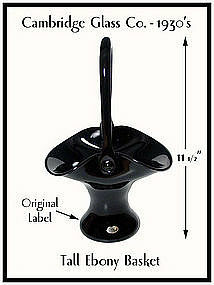 A tall Ebony basket with its original label and made by The Cambridge Glass Co. in the 1930s. It is in excellent, vintage condition with on damage and no repairs. Deep dark black amethyst color. The label does have a little wear on it on the one side, but still there.